Blossoms, Bees & Barnyard Babies returns (commence cooing). Will you finally meet a goat or lamb or bee or piglet you can call your BFF? Make for the Farm Trails of Sonoma County and find out. 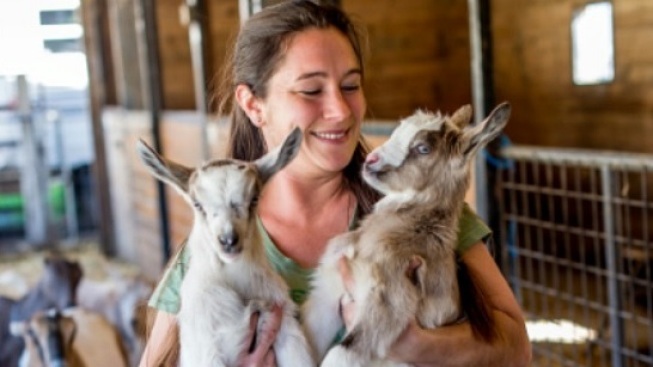 APRIL 29 AND 30, when all of the lambs and goats and bunnies and chicks and piglets and bees you normally see on a screen are right before your eyes, in and outside a variety of working barns. The two-day happening isn't just about baby critters (though, of course, they do have a knack for nabbing spotlights); visitors can learn about "...the origins of local food, and the amazing soils and systems that sustain the community." Tastings are part of the sunshiny scene, so prepare to mull over different honeys, cheeses, juices, and such. Food carts, country stores, and other shoppable stops will also play a role in filling out the full-as-a-picnic-hamper event. AND BEEKEEPERS... will be about, too, to discuss the importance of those pollinating wonders on the wing. You may even spy a baby water buffalo, too — a squeal of delight seems appropriate here — and other farm-fantastic sights, the kind of sights that help visitors know lots more about the day-to-day world of working with animals and the land. "Most of the stops are FREE," says the web site, but best register for free, now. Should we also mention that "animal cuddling" is one of the joyful activities listed for the weekend? That's pretty much the utmost zenith of possible weekend to-dos, so here we shall stop, bow, and politely conclude this post.